For those who prefer an incredibly large screen and feel that Samsung Galaxy S II Epic 4G Touch’s 4.52-inch large display is not good enough to offer an amazing viewing experience, now there is another new flagship smartphone from Samsung that seems a lot more like a new generation of smartphone, dubbed as Samsung Galaxy Note. The smartphone sports a stunning large 5.3-inch HD Super AMOLED WXGA screen (1280 x 800 pixels resolution) which the company claims as the world’s first and the largest high-quality display available in any smartphone, based on Google Android 3.2 (Honeycomb) operating system. In addition to the incredibly huge 5.3″ touchscreen display, the Galaxy Note also adopts an advanced S Pen input technology (built-in stylus), a lightning-fast 1.4 GHz dual-core processing power, high-resolution 8-megapixel camera with 1080p video capture capability, 2-megapixel front-facing camera, Wi-Fi b/g/n and HSPA+ connectivity. As you know, battery life is always an issue for phone with a large display, especially for Samsung Galaxy Note that features an incredibly large display consuming more power. But fear not, Samsung has addressed your concerns as a rechargeable large-capacity 2500 mAh lithium battery is assigned to support the high power consumption mobile device. Lastly, you might confuse that is it possible for such huge display handset to fit into your pocket. According to Samsung, the GALAXY Note which measures just 146.85 x 82.95 x 9.65 mm and weights in at 178 grams is portable enough to carry around. 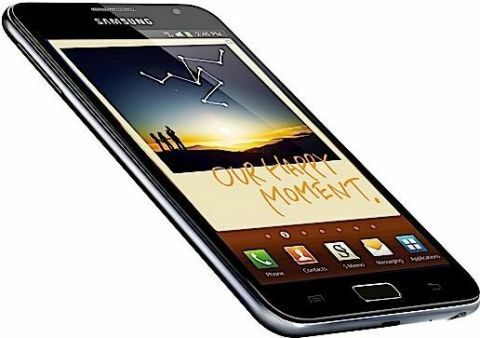 It seems perfect as the next hot-selling Samsung smartphone that rocks the world.